Use this pompeiiinpictures plan to access the photographs of the Casa del Centenario or House of the Centenary at Pompeii. If your screen is large enough (more than 853px wide) press the area you want on the plan to see the pictures. 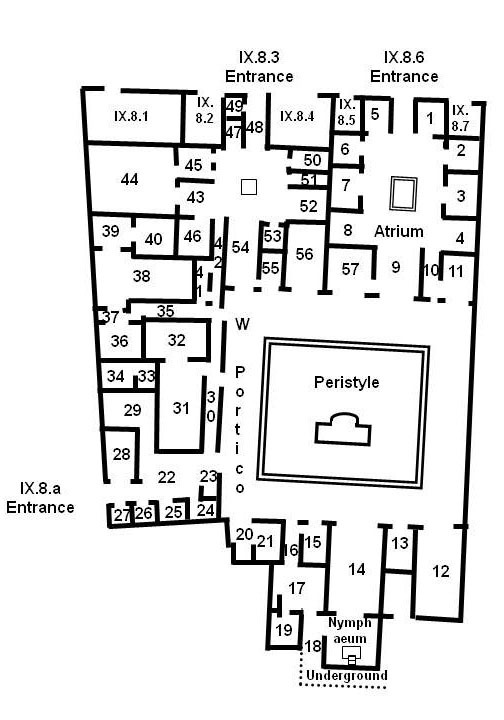 The room numbers are those referred to on the pompeiiinpictures pages at IX.8.6 which also includes IX.8.a and IX.8.3. The location of IX.8.1, IX.8.2, IX.8.4, IX.8.5 and IX.8.7 are also shown. 49 = Cella ostiaria or porter’s room?